Corks Out was founded in 2003 and our love for wine has led to an expansion to 5 stores and an award winning website. Each member of the Corks Out team plays a vital role in making the business work and they are truly dedicated to customer satisfaction with wine and spirit knowledge that goes far beyond passion. It has always been our aim to demystify wine and help customers to simply find out a little more about what’s in their glass – You don’t have to know anything about wine, you just have to know what you like! After introducing the wine tasting machines 6 years ago, we very quickly realised that our customers wanted something a little different from a normal bar experience. Therefore, we set about developing all 5 stores into Wine Bars as well as combining the quality retail range we had worked hard to develop. 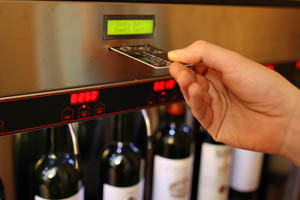 Now, not only do our tasting machines offer up to 32 wines by the glass, unlike most bars the wines on taste change monthly to offer you the choice at every price point you could imagine. We don’t just sell wine either you can enjoy a fine cocktail made with the highest quality ingredients or why not try one of our real ales, quirky gins and fruity liqueurs. Our Wine Menu is something we are very proud of, offering you a range of over 10 quality Champagne and Sparkling wine by the glass, Champagne Tasting Trio’s, a range of up to 10 specialist G&T’s where the garnish is as important as the Gin, not to mention a range of bespoke cocktails and classic long and short drinks all made with specialist products, not cheap brands. Light Bite Menu - It doesn’t stop there, to help you enjoy your ‘Drink In’ experience, we have put a small food menu together, such as Charcuterie, Cheese Boards, Tapas and light snacks. We only use fresh ingredients from suppliers who are as passionate about provenance as we are. A couple of our stores also have Coffee, Specialist Teas and tasty Cakes available. Over the years Corks Out has received over 30 awards and accolades for their customer service, team knowledge and point of difference in wine. Regular wine tastings, events and gourmet dinners are informal, yet informative. Although Corks Out is known best for its wine bars and stores, we also have a large online following. We have recently won ‘Online Retailer of the Year’ at the Harpers Business Awards. Judges commended on the wide range of Champagnes on the site offering high quality products at affordable prices.